Not only do you never know who is going to see, or hear, or read what. More importantly, you can never predict what they’re going to make of it. The same words, the same programmes provoke diametrically opposing reactions in different people. They can mean, they can signify utterly different things. There were some interesting observations about the way that perception of religion has changed over the past twenty years: "the progressive recognition that the long-predicted global recession of religion has not actually materialised." Along with this, there was a repeated insistence that the picture is all very complex and diverse. This may be so but the accusation that you are trying to simplify a complex issue is every current affairs broadcaster's answer to any attempt to clarify a moral or religious issue - whether it is abortion, the historicity of the gospels or the bias of the BBC against the Catholic Church. This bias was the subject of some of the questions that were asked after the talk. The first answer to this was to express the hope that the BBC had succeeded in being fair and balanced. When pressed further, the post-modernist thesis came into play: people will look at the same piece and have very different reactions. Both in the lecture and responding to questions, Thompson was quite definite in supporting the showing of "Jerry Springer - The Opera". It was a case of allowing people to make up their own minds; the warnings meant that people could switch off if they were going to be offended; it was a satire about daytime TV, not a satire about Christ; it would be a very "high bar" to set if you said "I am offended by this programme so nobody else can watch it either." During his lecture, Thompson commented on how the decision to show "Jerry Springer - The Opera" was not a purely academic matter since it can mean that you have to have a security guard outside you home. I suppose I would be oversimplifying a complex issue to point out that you would probably need more than one security guard if the non-satirised figure was from one of the other major world faiths. What interested me more, though, was the justification given going rather more carefully with Islam. This was to assert that Christianity is more central and accepted in our culture whereas other religions might be more associated with ethnicity. This may well represent some of the current false assumptions at the BBC that have replaced the assumption that religion is all finished and of no interest to anyone. There is the assumption that there is really not much harm in denigrating things that are central and accepted in our culture. This assumption has certainly been operating since the early 1960s but is it true? Satire certainly can have a part to play in any civilised society but if it is devoid of genuine moral outrage and simply destruction for its own sake, is this still something worthy of a public service broadcaster? 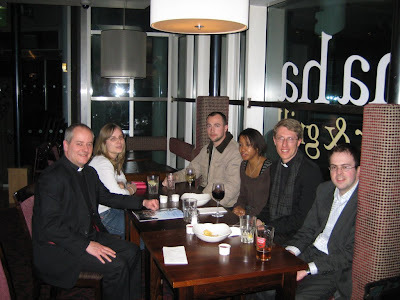 "C of E on the right! Holy Romans on the left! All the fancy religions up the middle and go and worship the other Jesus!" Which particular ethnic group is Islam associated with? or Catholicism? or Buddhism? 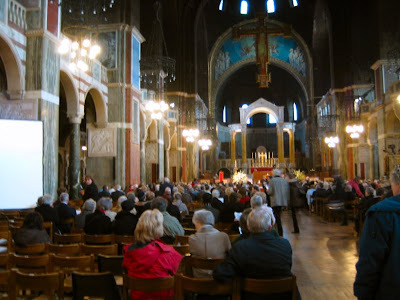 Certainly for Mark Thompson and the BBC, under increasing pressure over the bias that has so long existed at the corporation, the prestigious opportunity of presenting an apologia for its impartiality at the Cardinal's Lectures at Westminster Cathedral must have been most welcome. Frankly, it did not convince me to get a television and commit myself to the license fee again; and I am afraid that the news that the BBC is going to do a set of films about the Bible and a History of Christianity did not fill me with the enthusiasm it was obviously meant to. But then perhaps I just react differently to these things. A few of us met up afterwards. Knowing that the Cardinal pub would be jam-packed, I suggested the glass and steel "ha ha bar" across the road. I am increasingly impressed by this venue, especially the table service upstairs.